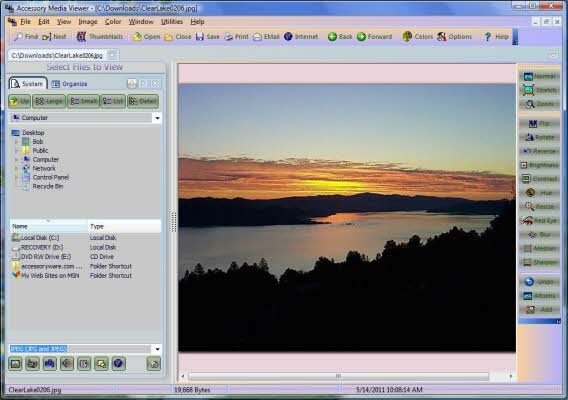 Accessory Media Viewer is a Image and Multimedia Viewer for Windows XP, Windows Vista, and Window 7,8, and 10 that helps you quickly Locate, View, Edit, Print Pictures, Documents, Multimedia, and Surf the Internet. File Types supported are JPG, JPG2000, uncompressed TIF, TIFF, BMP, ICO, CUR, PCX, DCX, PCD, FPX, WMF, EMF, FAX, AWD, XPM, IFF, PBM, CUT, PSD, PNG, TGA, EPS, RAS, WPG, PCT, CLP, XWD, FLC, ANI, SGI, XBM, TXT, BAT, LST, WRI, SYS, RTF, HTM, HTML, ASP, DOC, AVI, AVI(DivX), MPG, MPEG, MOV, MP3, MP4, ASF, MID, RMI, MP2, AIFF, QT, WMV, WMA, FLV, etc. Find and Play WAV, MID, RMI, AVI, MPG, MPEG, MOV, MP3, and MP4 files and save locations in Play Lists. Cut Video and Audio Clips, Join Video Files with same Frame size and resolution. Convert Files between AVI, MPG, WMV, WMA, WAV, MP3, MP4, FLV, MOV, etc. Create AVI or animated TIFF Files from pictures and add Audio Track from WAV, WMA, MP3 Files. Take Snap Shots of Video Clips Edit and Save as JPG and other popular File Formats. Create and Maintain any number of Video and Music Play Lists. Supports Windows XP, Windows Vista, and Windows 7. Multimedia Functions built with .